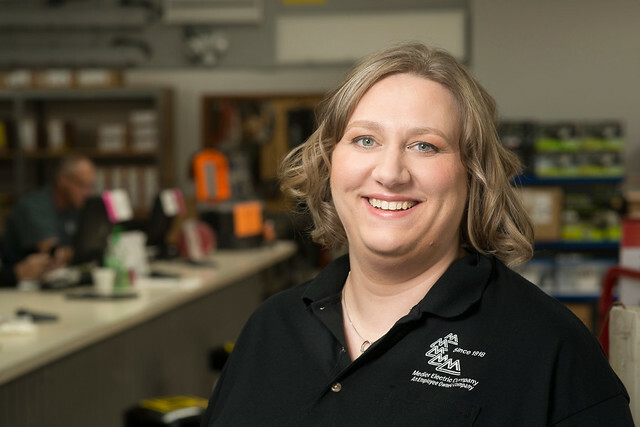 Like several of her “30 Under 35” honorees, Rhonda Messing’s start in the electrical industry came about somewhat by chance. In 2007, she was working at a lumber yard. She enjoyed the work but not the irregular hours and weekend schedule. Although she was switching industries, there were actually several customers from that lumberyard who were also customers of Medler. This helped in her adjustment to the new job, Rhonda explained. The Medler Electric branch (in Bad Axe, Mich.) wasn’t very large, she explained, meaning that employees did a number of jobs. Rhonda was able to become a versatile employee pretty quickly. In 2015 Rhonda was promoted to branch manager at Bad Axe. Rhonda attended the NAED’s Women in Industry conferences in 2016 and 2017 and came away enthused. Rhonda and her husband Rob have three daughters: Megan, eight years old; Emily, six years old; and Lilly who is two years old. They live on a working farm. In addition to her children’s activities, Rhonda has hobbies of her own. A. Learn as much as you can and don’t stop learning. Don’t think that you know it all because there is always something else to learn and always something to improve on. Q. What has changed the most in the industry in the past five years? A. Lighting. They have reinvented the light bulb how many times recently? And the lighting industry continues to change. It’s crazy how much it is changing. Manufacturers are coming out with wireless fixtures where you can wire an entire school, for example, and all you’d have to do is get power to the switch and power to the fixtures. There doesn’t need to be a line between the switch and the fixtures anymore. Along with improvements in energy savings, that’s the future of lighting. The other thing that has changed the most is with the Baby Boomers retiring, there are new ways to reach young talent. Not everyone reads a newspaper anymore, for example. You have to utilize social media and sometimes a website, instead of the traditional word-of-mouth or other methods.